Carbon dioxide capture and storage (CCS) is a technology aimed at reducing greenhouse gas emissions from burning fossil fuels during industrial and energy-related processes. CCS involves the capture, transport and long-term storage of carbon dioxide, usually in geological reservoirs deep underground that would otherwise be released to the atmosphere. Carbon dioxide capture and storage offers important possibilities for making further use of fossil fuels more compatible with climate change mitigation policies. The largest volumes of CO2 could be captured from large point sources such as from power generation, which alone accounts for about 40 per cent of total anthropogenic CO2 emissions. The development of capture technologies in the power generation sector could be particularly important in view of the projected increase in demand for electricity in fast developing countries with enormous coal reserves (IEA 2002a). Although, this prospect is promising, more research is needed to overcome several hurdles such as important costs of capture technology and the match of large capture sources with adequate geological storage sites. 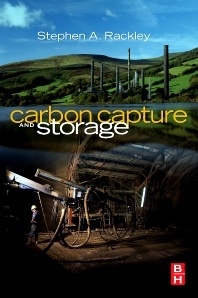 The book will provide a comprehensive, detailed but non-specialist overview of the wide range of technologies involved in carbon dioxide capture and sequestration. Stephen A. Rackley holds a Doctorate in Experimental Physics at the Cavendish Laboratory, University of Cambridge. He has worked for 26 years in the energy industry, with experience in some of the main technologies that are key to the currently most mature CO2 storage option - identification, assessment, monitoring and verification of sub-surface storage in the geo-sphere. More recently, his focus is on bringing significant new and evolving technologies to an advanced level (but non-specialist) student, engineering and project management audience.